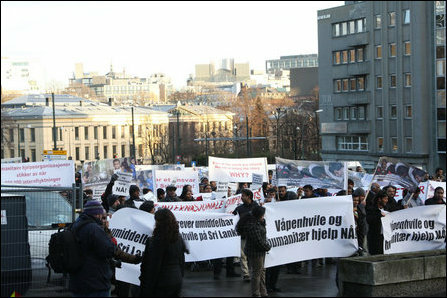 More than five hundred members of Norwegian Tamils' Federation (NTF) protested in front of Norway Foreign Ministry, Tuesday from 2:00 p.m til 3:00 p.m, demanding Norway to immediate intervene to stop the war waged on the people of Vanni by the Government of Sri Lanka (GoSL). 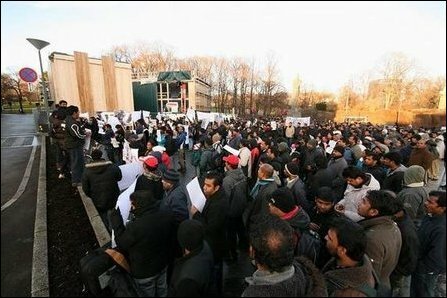 "Norway has the moral responsibility to stop the war on the Tamil people in Vanni," the protestors shouted during the demonstration. Jon Hanssen-Bauer, the Norwegian Special Envoy to Sri Lanka with Norwegian Tamil diaspora activist. Jon Hanssen-Bauer, the Norwegian Special Envoy to Sri Lanka on receiving the memorandum presented by the protestors said that he had talked to both GoSL and the Liberation Tigers of Tamil Eelam (LTTE) Tuesday. Norway has the moral responsibility to intervene in this matter as it was the main actor in trying to promote peace between the warring parties. Norway should urge GoSL to agree for an immediate ceasefire. 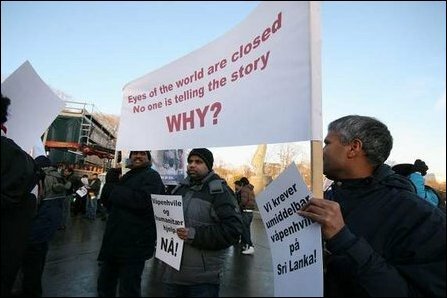 Norway should stop the genocide unleashed on the Tamils in Sri Lanka. The protestors held placards displaying the above demands throughout the demonstration.